Giga-tyres.co.uk offers a large selection of wheel tyre packages for your needs. In addition to various alloy rims with summer tyres, you can even create your own wheel rim package, such as when you are looking for specific rims and run flat tyres. 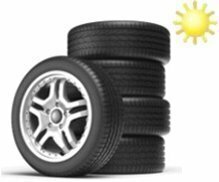 If you are interested in cold weather tyres and steel rims instead, we can also help you find just what you are looking for. This is where you can take a look around in order to discover complete wheels for different kinds of vehicles. Whether you are looking for tyre and rim packages for passenger cars, off-roaders, light trucks or SUVs, we would like to be of service to you. Please make sure that you are using the configurator in order to determine the right tyre and rim size that will perfectly match your car. As you are choosing a matching set of wheels and rims, you can opt for a number of top tyre brands, such as Dunlop, Michelin, Goodyear, Continental, Nexen, Nankang, Toyo, Uniroyal, Bridgestone and many others. These fully mounted wheels include all of the centring rings, caps and balanced screws that are required as well. Simply make your vehicle selection to find the right rims and tyres, which will greatly enhance the look of your car as well.